DogsBite.org - After Delta Air Lines issued a new policy on June 20, limiting emotional support dogs to one per person and banning pit bulls as service and support dogs, we reviewed top service dog organizations and their selected breed types. These dog breeds are overwhelmingly Labrador retrievers, golden retrievers, Labrador-golden mixes and standard poodles. Primarily, pit bull "breed advocate" groups, one who failed miserably, are pushing "pit bull service dogs." Accreditation by Assistance Dogs International (ADI) is the highest standard of accreditation for service dog organizations. We selected portions of website statements from accredited groups and candidates of ADI accreditation about why breed choice matters in service dog work. We also selected informational statements from other sources that explain why pit bulls, guarding and protection breeds are poor choices for service dogs, especially psychiatric service dogs. Decide what is more important to you -- having a service dog to help you, or having a particular breed because you want to be a breed advocate. Guarding, protection and fighting breeds are poor choices because many handlers with disabilities are not able to physically restrain them. Pit bulls do not show temperament until adulthood, about the age of two. If one year in training has already been invested and that dog "defaults" to its hereditary breed traits -- dog aggression -- it becomes unusable. Pit bulls and bully breeds create a social barrier instead of a neutral bridge between a disabled person and the community. Getting a service dog is supposed to be about making your life easier not more difficult. 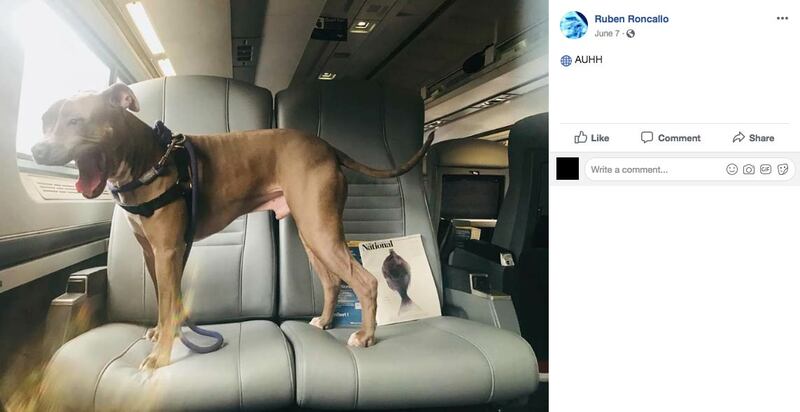 What truly lies at the heart of Delta's new policy, however, is reflected in their statement: "untrained, pit bull-type dogs posing as both service and support animals are a potential safety risk." 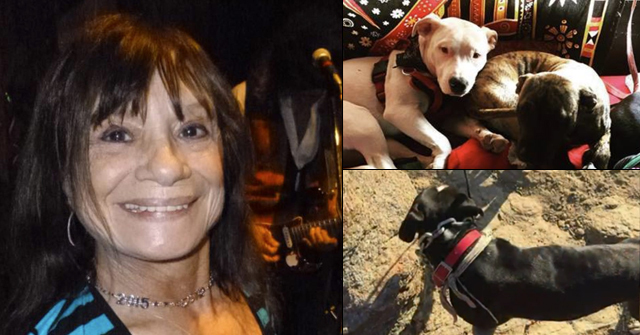 Tia Torres of Pit Bulls and Parolees addresses this on her adoption page in clear terms. Torres will not adopt one of her pit bulls to an individual "if your plans are to make it a service dog." Torres does not want her dogs placed into a situation that the dog may be unqualified for. Torres issuing this condition in July 2017 speaks volumes about the number of her fans hoping to abuse loopholes in the ADA and Air Carrier Access Act for breed advocacy purposes. 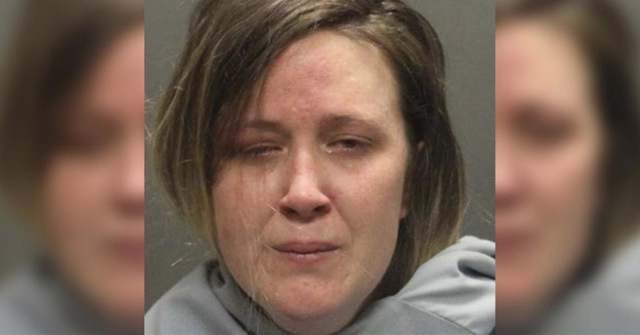 Delta's new policy is aimed directly at these types, as well as the narcissistic types, such as Kimberly Ferrell of Silverton, whose registered service dog, a "bull terrier-mix," attacked three people in one year and the owner of an emotional support pit bull in Killeen that attacked two people in nine days. This section highlights why breed choice matters in service work. We start with a quote from ADI that explains why a service dog should not be protective. Handi-Dogs Inc., next explains a fact about pit bulls that few, if any, animal shelters explain to an adopter: "Pit types can be genetically dog aggressive, and this may not show in the dog's temperament until it becomes an adult." Handi-Dogs also reminds that genetic breed characteristics cannot be "trained out" of a pit bull. An Assistance Dogs job is to make a disabled individual more able, not to protect them. The dog's presence is a natural deterrent. Because disabled people take their Assistance Dogs into public places and many are not able to physically restrain their dogs, the Assistance Dog must be safe for the public. Many dogs, especially working breeds, will sense their owner's disability and their vulnerability. These dogs can learn on their own to protect at inappropriate times. This can be compounded by an individual who doesn't recognize that they are unconsciously encouraging this behavior. Pit Bull types (American Staffordshire Terrier, Staffordshire Bull Terrier, Pit mixes) are not recommended for service dog training for several reasons: 1). Terrier breeds can difficult to train for service work if the dog has the typical independent terrier temperament. Do not assume that the dog you choose will be the exception; 2). Pit types can be genetically dog aggressive, and this may not show in the dog's temperament until it becomes an adult. If this develops after you have invested a year in training, you will not be able to use the dog in public; 3). You are training a service dog to help make your life easier, not more difficult by facing municipal breed specific legislation, breed bans in rental housing, additional insurance costs, and public access challenges. Training a service dog will require a commitment of time, energy, and money. All dogs are individuals, but do not assume that the individual dog you choose will be the exception to genetic breed characteristics, or that you can just "train it out of him." Choosing a breed with the genetic temperament for service work will greatly affect your success. You must decide what is more important to you -- having a service dog to help you, or having a particular breed because you like the way they look / had one as a child / want to be a breed advocate. Not all breeds are recommended for service dog training. Bully breeds or mixes can be a social barrier in providing a neutral bridge between the Veteran and the community. Bully breeds include but may not be limited to: American Staffordshire Terrier, Bull Terrier, American Bulldog and Bull Mastiff. Clear Path does not take a stance against bully breeds; however, these breeds are not recommended for our owner/trainer service dog program. If you're looking for a psychiatric prospect that narrows down your options quite a bit. You don't want any breed prone to developing protective instincts (think German Shepherds, Dobermans, Rottweilers, Livestock Guardians, and other breeds known for their protective nature). The trouble with protective breeds is that often that instinct doesn't kick in until the dog has matured. Therefore, you could put around 2 years of training into a dog just to have an otherwise amazing service dog in training become extremely protective and subsequently have to be washed out. You'd end up losing two years of time and money and gain a lot of heartbreak. It simply isn't worth the risk. This section is an extension of the "psychiatric prospect" aspect and highlights a real world example of a group's attempt to train rescue pit bulls for psychiatric service dog work. In their own words, they describe why pit bulls are unsuitable as psychiatric service dogs due to "reflecting the symptoms of their handler's PTSD." They also note that "the longer the team spends together, the more the dog's training would 'unravel' and revert to the genetic disposition of the dog." Pit Bulls 4 Patriots was launched in 2011 as a specialty group only training rescued pit bulls to help military vets with PTSD. However, in less than a year, their pilot program fully broke down due to problems with the pit bull breed. By 2012, the group resurfaced under the name, Hounds 4 Heroes, specializing in only using rescued greyhounds to help military vets with PTSD. Both sites are now offline, but we captured their "explanation" before they shut down Pit Bulls 4 Patriots. What began as a "breed advocacy" service dog stunt in 2011, ended in near disaster. The pit bulls "sensitivity" puts them at risk of becoming "unbalanced by constantly reflecting the symptoms of their handler's PTSD," they determined. Because most of their dogs "washed out," the group was then stuck with pit bulls they could not adopt out. "The founders' home became filled with dogs and we were thus unable to take in new service dog candidates to train," states the group. On the dog side we learned a lot from the very capable, loving and loyal pit bull terrier type dogs in our program. It became apparent that this is perhaps more difficult for the dog than any other type of service because of the extreme emotional/energy state of the handler with Post Traumatic Stress Disorder. We have found that over a period of time the dogs' sensitivity, which is normally a wonderful trait, puts them at risk of becoming unbalanced by constantly reflecting the symptoms of their handler's PTSD. We became clear that we need dogs who are able to provide calm in any situation rather than matching the handler's feelings. Also, it is critical that PTSD service dogs can adapt and recover quickly from stress, and to be resilient enough to do that again and again. The founders provided more information after they started Hounds 4 Heroes. Blogger Craven Desires captured these statements in a 2015 post. While working with greyhounds, the trainers discovered they did "not have to train over any strong genetically bred instincts and drives (such as protection/guarding, being territorial, herding, dog aggression, or hunting)" and that the genetic instincts and drive the dog defaults to (fighting breed vs. greyhound) is a critical matter of safety. This section highlights dog breeds most often selected by ADI accredited organizations. There certainly are a number of other breeds that can be trained to perform service dog tasks, the priorities being: easy to train, enjoys working, even temperament that will last the dog's life time, low arousal, low prey drive, good problem solving skills, and if the dog should ever "default" to its hereditary breed traits and disposition, both must be safe for the handler and the public. Guide Dog Foundation dogs learn how to lead a person in a straight line, find and follow a clear path, maneuver around obstacles (both on the ground and overhead), and stop at changes in elevation, such as curbs and stairs. They are also trained to be extremely well behaved when in public places. We use Labrador Retrievers, Golden Retrievers, Labrador/Golden crosses. Standard Poodles are available for individuals or their immediate family member's with documented allergies. These working dogs are smart, fit, and highly trained, like elite athletes prepared for the challenge. Through cutting-edge genetics and breeding, innovative puppy education, positive home experiences, and expert training, we're creating healthier, stronger, more intelligent dogs that love people, love to learn, and live to please. Through our advanced pedigrees of Labradors, golden retrievers, and goldadors, we're changing the world, one extraordinary dog at a time. Warrior Canine Connection's (WCC) dogs are Golden and Labrador Retrievers specially bred for health, temperament and longevity. The WCC Director of Dog Programs researches at least 12 generations of each dog's pedigree to obtain an accurate picture of his or her genetic potential to become a successful service dog for a wounded Warrior. The dogs we breed at the Foundation have a success rate for guide and service dog work that is well over twice that of dogs donated as puppies by breeders or from a shelter. By breeding our own dogs, we have a proven history that goes back many generations to assess a dog's temperament, health, and overall suitability for guide and service work ... Our breeding colony has over 100 dogs, the majority of which are Labrador Retrievers. The other breeds we use include: Golden Retrievers, Standard Poodles, Lab/Golden crosses. ADS dogs are of the highest quality, with optimal health, temperament, maturity and adaptability. The types of dogs trained are Labrador retrievers, golden retrievers and some Standard Poodles (specifically for families with allergies). For the most part, COPE has trained Golden Retrievers, but has also worked with Labrador Retrievers, Standard Poodles and Barbets. The breeding and training program reinforces desired traits in a service dog, including work ethic, low arousal, low prey drive and good problem solving skills. Our Service Dogs usually need to be of a larger, solid build, and are often Labrador Retrievers or Golden Retrievers ... Our Hearing Dogs are usually smaller breed dogs (under 40 pounds), but occasionally we will train a smaller Labrador or Golden Retriever if the dog has a suitable temperament. 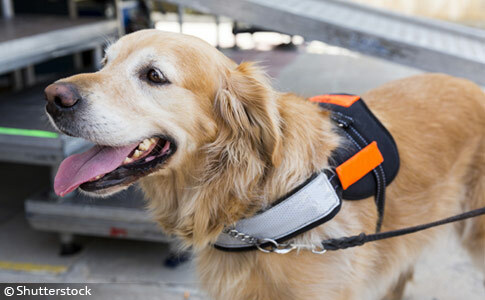 There is a reason why the public correlates Labradors and goldens with service dogs; they are the two most popular breeds used in service dog work. There is a reason why the public is distrustful when being told, "My pit bull is a service dog." Because only "breed advocate" owners and groups push pit bull service dogs, whether the dog is trained or not. Whereas the goal of a legitimate service dog training group is to produce amazing, productive and safe dogs for the truly disabled. The second video demonstrates a goldendoodle passing a Public Access Test. Certification of passing this test is not required by the government under the ADA or Air Carrier Access Act, but passing it is required to meet the minimum training standards of the IAADP and is a benchmark for service dog training groups and those who are self-training their service dogs. The 9.5 minute video shows just how high of a standard these dogs are held to when working out in public. 1The subway attack by Ruben Roncallo's fake service pit bull and his arrest occurred in late April. At that time, Roncallo had 311 complaints lodged against him. 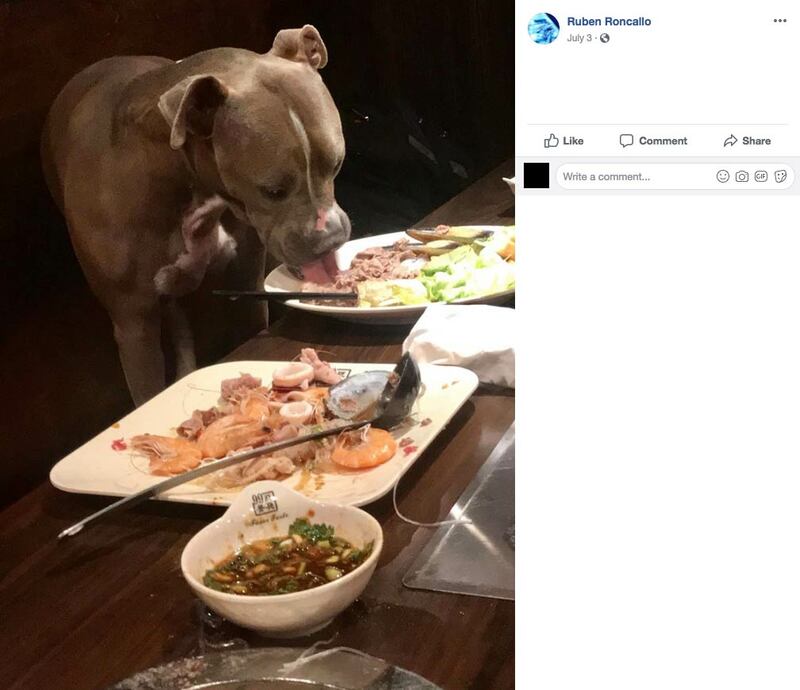 As of June 7, Roncallo continues to flaunt his fake service pit bull in a transportation venue and as of July 3, in a restaurant as well. Both are violations of the ADA. This is a known attack dog. Any business can kick out this dog because it poses a "direct threat" to their employees and patrons. Thank you for this article!! I am a service dog handler,; actually my third service dog from Canine Companions for Independence is laying against my wheelchair as I write this. I have been telling people for years that NO reputable service dog organization or therapy dog group will utilize pit bulls and for extremely good reasons. The only pit bull “service dogs”I have come across are owner trained, and that is worrisome. No one confirms the ‘handler’ has a qualifying disability and no one checks the training of the dog, let alone the poor choice made of trying to use a pit bull as a service dog. Pet owners can simply go online and order gear that proclaims the dog is a service dog in their attempt to take them everywhere. When we as SD handlers go out into public places, we are asking the public to assume our dog is properly trained and socialized and poses no harm. How can you assume that if the dog you chose is a pit bull? As your article states, there are reasons reputable service dog organizations generally have their own breeding stock and choose yellow and black labs as well as golden retrievers and mixes of the two. While working they are focused, wanting to please the handler and ignoring distractions. There is currently a pit bull advocate who takes his pit bull into malls and encourages people to pet it…another thing true service dog handlers do not do. The man has no known disability and from the videos he proudly shares, anyone can tell the dog is not properly trained for anything, let alone SD work; it does not focus on the owner, does not stay beside him, and approaches strangers trying to solicit being petted. We do not have a service dog at our side to advocate for the breed, get attention, or try to be popular—we have them at our side because we need the help and independence they provide. Thank you again for this wonderful, insightful article. I hope it is shared many, many times over! Great article and great comment! Great comment, thank you! It is so true that SD handlers are asking the public to have confidence that their SD is well-trained and SAFE! I remember reading about the history of the Seeing Eye and they said that part of their mission was to get the public to accept these dogs because at the time, there were no laws protecting them or giving them access. The earlier generations of SD handlers and SD trainers have taken on the responsibility of being SD ambassadors to the public which is why the public has had so much confidence in them. And pit bull fakers are destroying that confidence. Pitbulls as “service dogs” is just another in a long series of scams that pit bull lovers are trying to pull, in their endless quest to lie, lie, lie about the deadly hazards of their dogs. Pit bull owners are like junkies. Anybody who deals a lot with junkies can tell you Rule#1, don’t believe a word they say. I applaud you for this factual article!! Also a LEGITIMATE Service Dog Handler I’ve had breeds from setters to Newfoundland’s to my 4th Great Pyrenees. I’m also a proud member of IAADP and both my current SD’s are Registered as Service Dogs with the State of Michigan. Just like getting a handicap parking placard where your LICENSED, TREATING PHYSICIAN has to verify and fill out paperwork testifying true DISABLED EED for such Michigan is offering the Voluntary Registration. This SHOULD be made legally recognised by at the Federal level and each State SHOULD be responsible for registration and verification as they’re most able to verify physicians license and validity versus FAKE, Online Registries. Some States are offering this now and easily implemented throughout every State quickly. Plus, mine has an ID# with Government Website to look up quickly if it’s legitimate. Also, NO “REAL Service Dog” will be having to wear a prong or electronic collar or both whilst out in public!! If your dog can’t be correctly controlled on a basic flat collar than it’s not legitimate!! I use 2 Great Pyrenees always and NEVER have issues except for the Pits trying to attack us. Funny how people in grocery stores fail to see 2 big white furry dogs until they are literally past them!! They normally follow single file behind wheelchair if needed!! Thank you for the insights. I didn’t know Michigan had a voluntary registry. do you know if other states do the same thing? The thing is, it doesn’t matter if a pit bull is ‘trained’ or if it’s ‘posing’ as a service dog or IS a service dog, they are by nature temperamentally unstable and can never be trusted and should never be used as any kind of service, therapy, or support dog. This is an excellent article. I had looked up Service Dog training organizations’ policies on fighting and protection breed dogs 6 or 8 years ago, and I didn’t find much at all. This is all recent, and very necessary, policy additions! I’m glad they’re taking a stand. I got negative feedback for supporting the common sense move by Delta to ban pits and pit mixes from use as service dogs on their planes. Some people claimed that pits were good dogs for police work. What a bunch malarkey. Pit bull poleese dogs is a SCAM being run by Animal Farm Foundation as seen here: https://scorchedearththepoliticsofpitb.blogspot.com/2016/01/pit-bull-roundup-fulton-county-drama.html And here: http://sruv-pitbulls.blogspot.co.uk/2016/01/steve-croft-pit-bull-entrepreneur.html Basically, they find a police department that is too broke to afford a REAL police dog and then offer them a free pit bull poleese dog/publicity stunt dog for FREE complete with all the training. Riiiiiiight. Must be the reason NONE of these pit bull poleese dogs are used for apprehension but only for sniffing, which ANY dog is capable of. Thank you so much for this article! I hadn’t realized how many SD groups openly state that bully breeds and other guardian dogs should not be used. The game dog breeder’s response: “Don’t intervene. We’re dealing with psychopaths, dogs and people. Doesn’t say that Protection BREEDS are strictly prohibited actually, it says “attack TRAINED” “protection TRAINED” or “who exhibits aggressive behaviour” are prohibited. Does not mention breed at all. Though I am in agreement that for the most part protection breeds would be unsuitable to be assistance dogs. Non-protection breeds can certainly be attack trained, look at IPO poodles and border collies – they’re quite impressive even though never bred for bite work. And of course we know some people (often drug dealers) train their pit bulls to attack people. I think the IAADP is excluding any dogs that have been bite trained as assistance dogs (so personal protection dogs, police dogs, military dogs, IPO trained dogs, KNPV dogs etc are excluded) as well as any dog (of any breed) that displays aggressive behaviour. Not all individuals of protection breeds are suitable for protection work and some have an atypical temperament and are very soft – these wouldn’t be prevented from acting as service dogs according to the wording used by the IAADP. 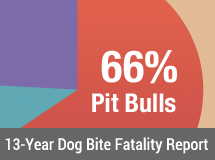 Pit bulls are not a protection or guarding breed (and never have been) in any case. They’ve always been fighting and bloodsport dogs. Thus we highlighted in gold the following “who do not have previous experience handling a dog with a strong Protection drive, a fierce Territorial instinct or a hereditary dog aggression problem should not attempt a partnership”. As far as the footnote goes, we stated that in full as well. To repeat this (again): “IAADP Policy Prohibiting the Enrollment of Protection Trained or Aggressive dogs – Any dog who is protection trained, attack trained or one who exhibits aggressive behavior in violation of our Minimum Training Standards for Public Access is NOT eligible for enrollment as an Assistance Dog in IAADP, or renewal, no matter what disability related tasks or alerts the dog is said to perform. If an IAADP Partner member’s dog later displays aggressive behavior and cannot be rehabilitated within a reasonable time period, ethically, that dog should be retired as unfit for duty outside the home, as the dog does not qualify as an assistance dog under our Minimum Training Standards for Public Access. Non aggressive barking as a trained behavior will be acceptable in appropriate situations.” We added underlines for emphasis too. There’s a new viral video of a “service dog” interacting with a lion at the Cincinnati Zoo. The dog (some sort of black & tan mixed breed) is of course, not behaving like a proper service dog, it’s running back and forth, barking, and the lion is trying to attack the dog through the glass. Dogs at zoos now…just think of the the you-know-what-storm this is going to cause. Rare exotic animals mauled to death? Predatory animals attacking dogs when they leap into exhibits? 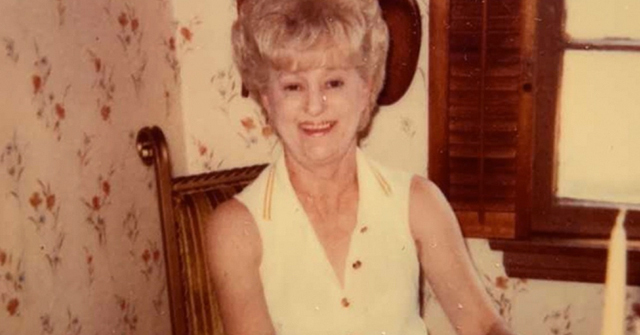 As a licensed mental health professional, I am sick of the requests I receive from individuals who want me to sign off on their need for an “emotional support” dog to avoid paying pet deposit fees, pet rent and to take their dog on a plane. I frequently see individuals who are begging for attention by walking their dogs through stores, searching my face to see if I will acknowledge their pet. I don’t gratify their need. I love dogs. I own dogs. I see no reason for parading them around in public places. The individuals who possess these fake emotional support animals would be better off investing in therapy to find out why they need attention or why they lie to avoid fiscal responsibility.